Homemade fried rice rarely achieves the taste and texture of restaurant fried rice for a very simple reason. 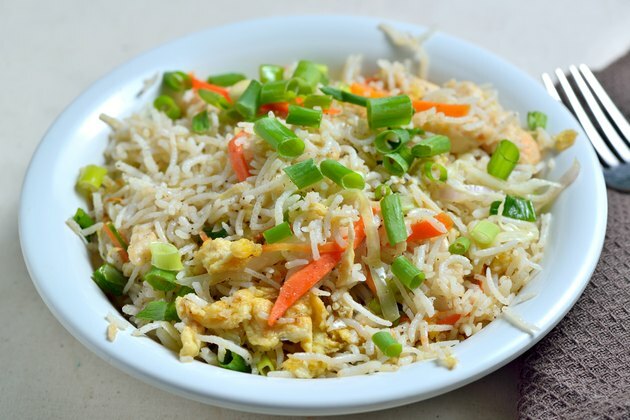 Many home cooks don’t know the secret behind traditional fried rice: using dried cooked rice. Asian chefs use day-old rice for fried rice because freshly-cooked rice becomes too soft and loses its shape when fried. Drying out rice in the freezer is an effective shortcut if you’re making fried rice tonight but forgot to prepare the rice last night. Spray a baking sheet lightly with nonstick cooking spray. Place the cooked rice onto the center of the oiled baking sheet. Spread the rice out on the baking sheet with a spatula. Make the layer of rice as thin as possible. Place the baking sheet in the freezer, and set the timer for 30 minutes. Remove the rice from the freezer when the timer goes off. Let the rice come back to room temperature and blot it with paper towels to before frying it to avoid any water from melting ice crystals. Do not leave the rice in the freezer for more than 30 minutes or it will freeze. How do I Make Rice Noodles at Home? How Many Calories Are in Hainanese Chicken Rice?